Summary. ETC warn that if we will not unite consciousness and will not make the Transition life-cycle of each of us and whole civilization will be not finished. 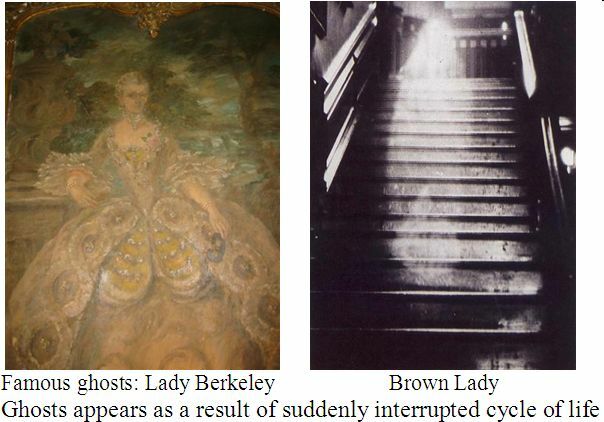 Consequently, our civilization will be the civilization of ghosts. In this case in the solar system will not be fulfilled the Program of consciousness improvement. So, very soon the solar system will be destroyed by special mechanisms of the universe designed specifically for these purposes. 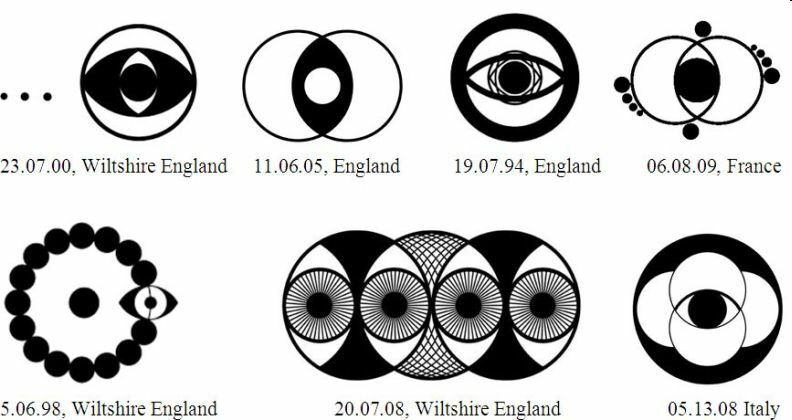 On this pictogram by triple repetition of the symbol of dematerialization – a pointed oval is created two levels of drawing external (fig. 1) and internal (fig. 2). The pointed oval is the main symbol of dematerialization. 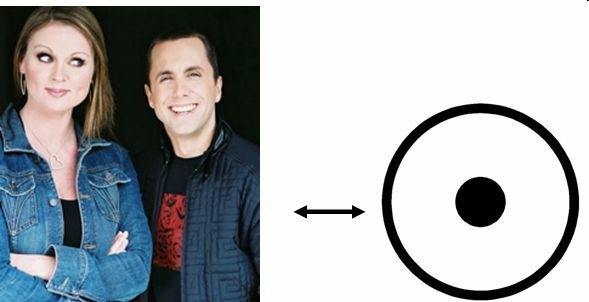 Most clearly this oval is represented on internal part of the pictogram (fig. 2). Each individual cell is a representation of human being at the Information level of the Universe. The appearance of a pointed oval of dematerialization specifies on consciousness association of two or more people. In the result a brain area of the united cell expands. However, actually this allegory represents the united consciousness of mankind. Moreover, the entire picture is made from ovals of dematerialization each of which is a result of consciousness unification. Multiple repetitions of ovals of dematerialization strengthen this information. It emphasizes the association of civilization’ consciousness – 6.85 billion people. 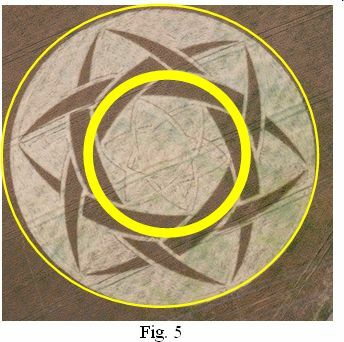 ETC presented the symbol of dematerialization for understanding the bases of their flights through the universe. ETC constantly make intergalactic flights in hundred of millions light years by means of teleportation. They dematerialize from the level of the Crystal structures (LCS) in one place of the universe and materialize in other chosen place of the universe. ETC make teleportation through one of sublevels of the Intermediate level (IL) of the material world where time and space are compressed. ETC teleportation is based on action of the united consciousness which cause a body transformation. It is necessary for transitions on parallel sublevels of the material world. Teleportation for flights can make even two ETC representatives. More information about ETC teleportation is written in our 12 books, based on channeling and decoding of ETC pictograms. Two of our books – «System of an Information Transmission of Extraterrestrial Civilizations» and «Letters of ETC - the Last Warning» – we published in the co-authorship with Marina Popovich – a big friend of our family. Marina Popovich, Ph.D. (in the center of the picture), is a military test pilot of the first class, has 101 world aviation records, world known as «Miss MIG». She is in Guinness World Records. A star in the Cancer constellation is named after her. Marina Popovich is in close contact with many astronauts, members of the Governments and renowned people who deeply believe in existence of ETC. Among them is Erich von Dдniken, the author of numerous bestsellers about activity of ETC on the Earth. Marina Popovich proves the existence of UFOs by thousands stories of pilots and astronauts around the world how they met with UFO in flights and how ETC helped to get out from emergency situations. ETC assert that a few people of Earth cannot make the Transition, through association of their consciousness. Only whole civilization can make the Transition to another level of the material world. However, humanity of Earth still even does not know about powerful possibilities of our consciousness. Why we need the transition to nowhere? We live here, not too bad! In thousand crop circles ETC warn: today our Earth is in an emergency situation due to critical decreasing of its magnetic field. Soon global cataclysms will begin. On our planet in the nearest future will start powerful disasters of unprecedented force: earthquake, tsunami, earth crust breaks, hurricanes, flooding, etc. ETC confirm that catastrophes will never stop, and will only amplify. Our entire planet will seem to come alive. Mankind can not change the nature of our planet. We will not be able to adapt to future natural disasters, there will be no place to hide. Living on the planet will become impossible. The only way to prolong our life is to dematerialize from the level of global cataclysms and to transfer to a safe zone – on the Highest level of the material world without cataclysms. For our Transition, we need to form the united consciousness cell of civilization with a homogeneous structure that can cause an action as the laser beam. The laser beam will remove our bodies from the level of Crystal structures, where global cataclysms will rage. Simultaneously a new holographic body will arise on the Highest level of the material world. There, at a safe level we will continue our life in two categories: hell and paradise – as over thousands of years predicted the Holy Scriptures. 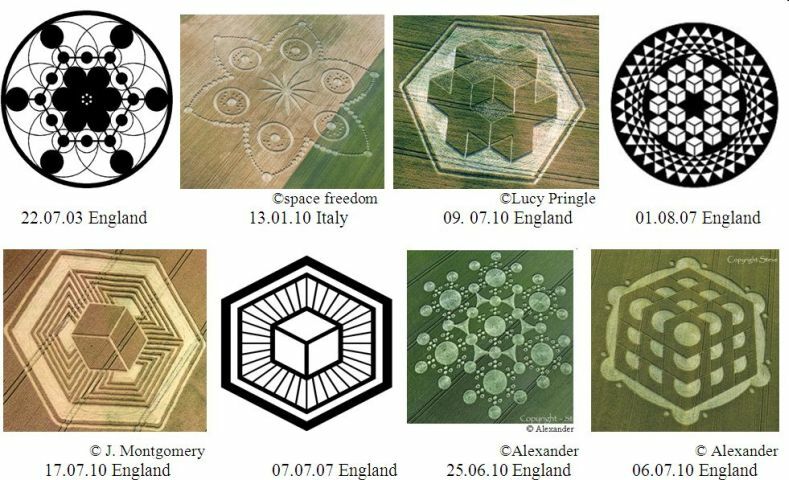 Therefore, to continue our life through the first our Transition ETC give us instructions in thousands of crop circles. 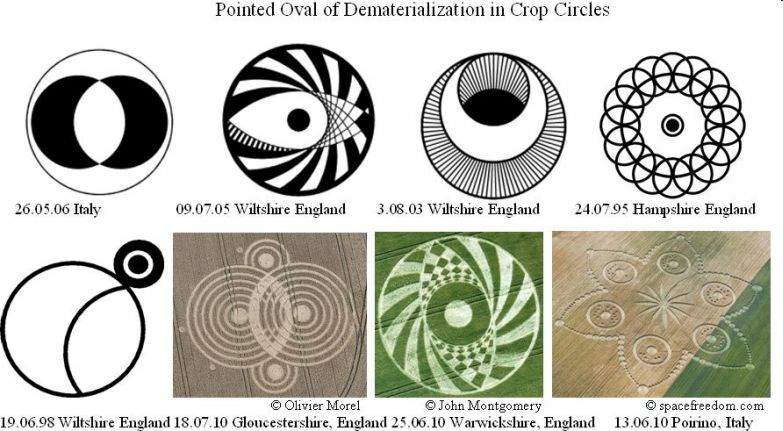 Below are some examples of ETC symbols of a pointed oval of dematerialization. In the center of the picture a circle is shown (fig. 3). 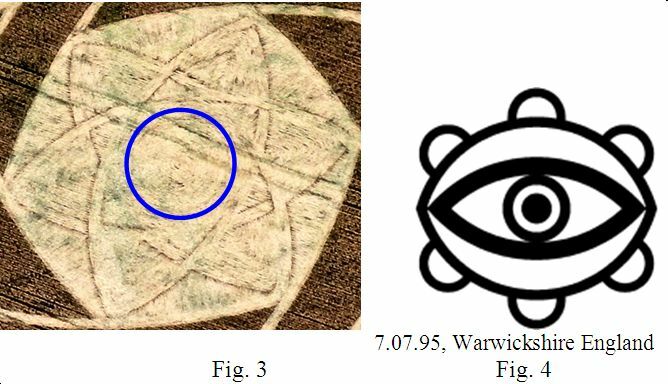 This image shown in the center of a pointed oval of dematerialization represents a symbol of «eye» (fig. 3, fig. 4). 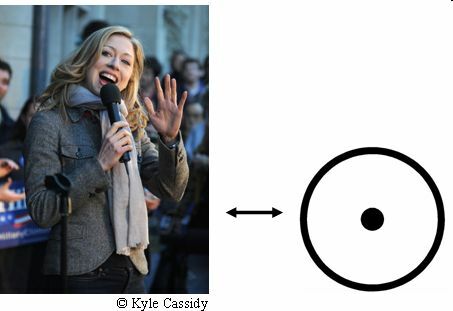 The ends of the inner and outer ovals form regular hexagons, underlining the carbon basis of our lives. It indicates that this information is for us – the Earth dwellers. 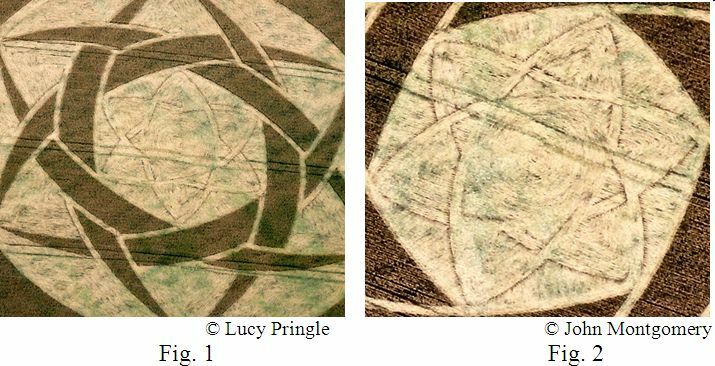 ETC often represent carbon basis of our life in crop circles. Here some examples. The oval of dematerialization is repeated three times. Triple repetition of an oval of dematerialization means our dematerialization together with three previous levels of consciousness which are included in our cell. These are levels of consciousness of an inorganic and organic nature. Let’s consider the outer part of the picture. Each oval of dematerialization is represented by two crescents. Typically, the crescent is a result of the shift of a brain area of an individual cell at the united consciousness formation. Therefore, it is more roundish. Shown on the pictogram crescents which form the external part of the picture are not half-moons, but sharp daggers. The internal interlacing of crescents, on one hand, forms a hexagon which underlines a carbon basis of our life. On the other hand, it is a presentation of the expanded brain area of the united cell (fig. 5). At the decoding of this pictogram it is very important to consider its location. 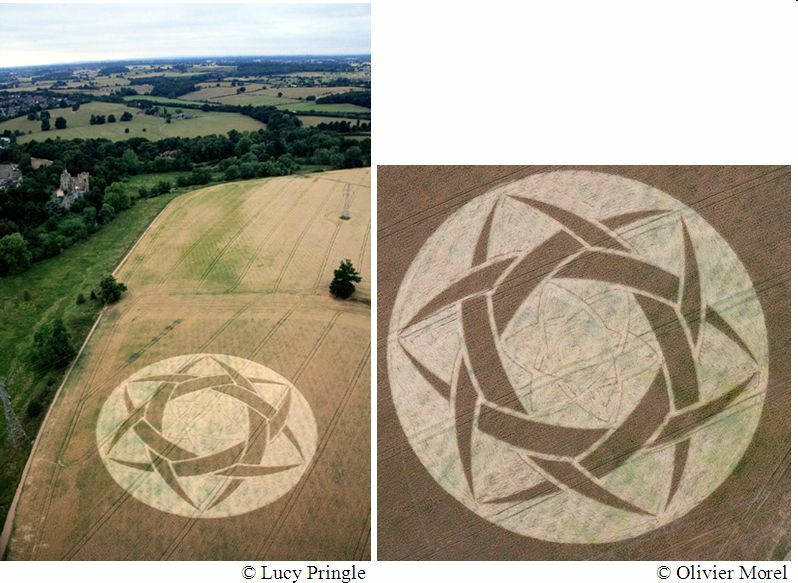 ETC have placed this pictogram near a mysterious place – Guys Cliffe, nr Old Milverton, Warwickshire. 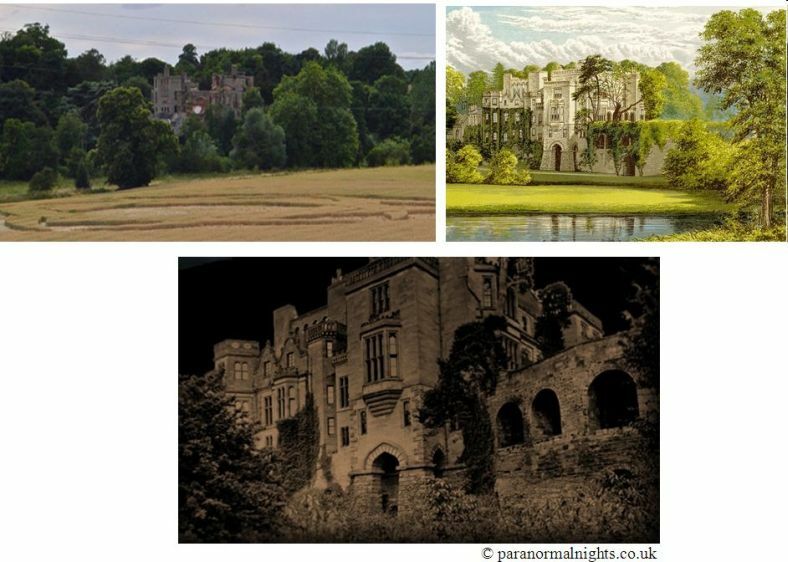 About this place there are many legends connected with ghosts. 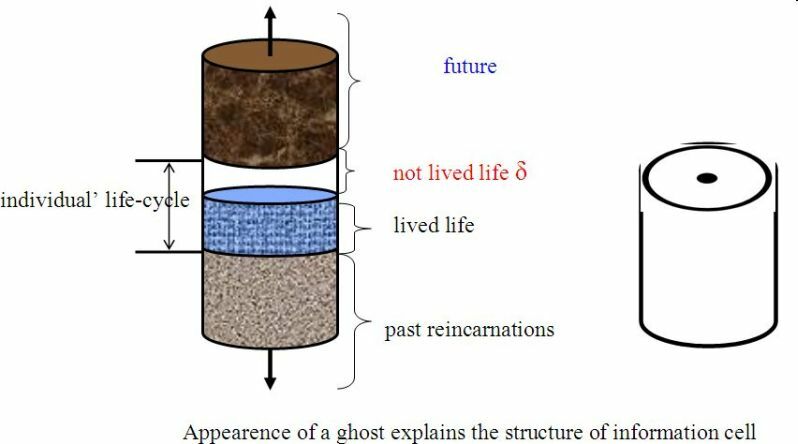 Ghosts appears only if the life’ cycle of individual does not end completely, and is suddenly interrupted. An information cell should always have its projection in the form of human being in the material world. Only by this way consciousness perfection is possible. Thus, the appearing ghost is the phantom of an individual which has arisen from the moment of interruption of his cycle of destiny. When an individual dies of old age, i.e. at the end of his life cycle, the corresponding layer of his cell completely closes and seals. If the life of individual breaks suddenly, the area of a cell, corresponding to life of the given person is not closed, and remains open. Therefore a cell at any opportunity, i.e. under appropriate conditions, tries to restore its projection in the material world. This projection just is a ghost, because it is not a human being, but only his hologram-phantom. Our generation is unusual. We are the best generation through Earth civilization with the highest level of consciousness. Just we are entrusted with such a great honor – to make the Transition in the next cycle of life. Thereby, we will complete the cycle of Consciousness of Earth’ civilization. We should make this Transition due to beginning of global cataclysms. Thus, if we fail to unite consciousness and make the Transition in time, the life-cycle of each of us – of the entire civilization of Earth will be not finished. Consequently, our civilization will be the civilization of ghosts. If we, according to ETC instructions will make the Transition in time – we will transfer in the next cycle of life, which will begin at the Highest level of the material world. It will the cycle of Correction with hell and paradise. Today there are many communities of association consciousness with the uniform purpose. Lately arose one more. Thus, 7 April 2010 in Lilongwe, Malawi, famous pop-singer Madonna together with Earth Institute, the company Ericsson and non-profit organization Millennium Promise announced a new worldwide education initiative, which purpose is providing primary and secondary education to children worldwide. Thus the special attention is given to secondary education of girls. In an initiative called «Connect To Learn» children will be granted scholarships for secondary education, while in schools will be introduced infocommunication technologies (ICT), which will improve the quality and availability of education in general.